Meatballs are for more than just spaghetti or sub sandwiches. These delicious little morels can and should stand on their own. Frequently now, I’ll serve a few meatballs, dusted with parmesan cheese and a bit of olive oil as an appetizer, or even a small main dish, maybe with a side salad. 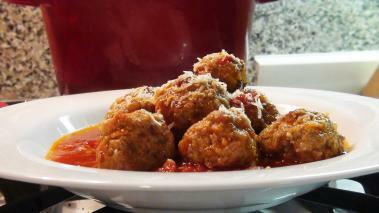 This recipe for Mini-meatballs is perfect for parties, where you’ll looking for “tooth-pick” food. Or, I’ve found that kids absolutely love these guys, as they are sized perfectly for them. They freeze well, so make a large batch, because you’ll get asked for them again and again. These mini-meatballs are actually a very tomato driven recipe. And with tomato recipes, I almost always recommend a Chianti, or Sangiovese wine. They both have a natural affinity for tomatoes, and I think you will love the match.